Happy Chinese New Year! It’s the Year of the Tiger. Though it is totally unrelated, Survivor’s song, Eye of the Tiger, keeps going through my head. It turns out to have been the #1 song of 1982. Did you remember it was also the theme song for Rocky III? That’s your music trivia for today. Usually, we make an Asian noodle dish to welcome the Lunar New Year, but this year, the recipes for Stir-Fried Broccoli in the latest issue of Cook’s Illustrated inspired a change of menu. I marinated and stir-fried a flank steak from Codman Farm. Howard prepared Stir-Fried Broccoli with Chili-Garlic Sauce from Cook’s Illustrated. We mixed them together for Beef with Broccoli and served it over steamed rice with an arugula salad with a soy dressing. Combine ingredients for the Beef Marinade: Stir together the sherry, baking soda, soy sauce, cornstarch, sesame oil, and sugar in a medium bowl. Add the beef, mix well, and marinate in the refrigerator for 30 minutes. Combine garlic, pepper flakes, and oil for Chili-Garlic Oil. Combine ingredients for broccoli sauce: Whisk together chicken stock, sherry, soy sauce, sesame oil, cornstarch and chili-garlic sauce. Heat 2 Tbsp oil in a large skillet over medium-high heat until just starting to smoke. Add beef with any remaining marinade. Sir-fry until beef is lightly browned, about 3 minutes. Set aside. Heat the remaining tablespoon of oil in the same skillet over medium-high heat until just starting to smoke. Add broccoli and sprinkle with sugar. Cook, stirring frequently, until broccoli is well-browned, 8 to 10 minutes. Push broccoli to the sides of the skillet. In the center of the skillet, add chili-garlic oil and cook until fragrant, 15 to 20 seconds. Stir cooked chili-garlic oil with broccoli. Add Broccoli sauce. Cook, stirring constantly, until broccoli is cooked through and sauce thickens, 30 to 45 seconds. 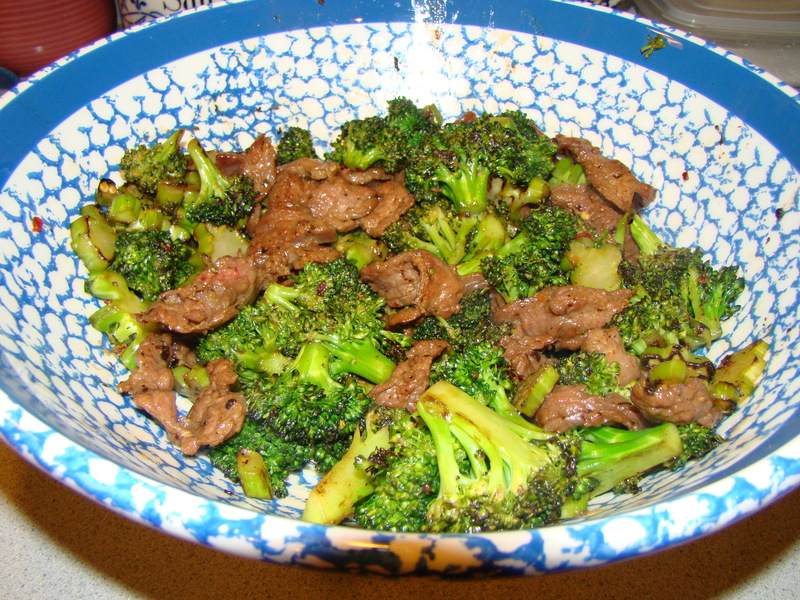 Return beef to the skillet and combine well with the broccoli. Posted on 14 February 2010, in Meat CSA and tagged broccoli. Bookmark the permalink. Leave a comment.